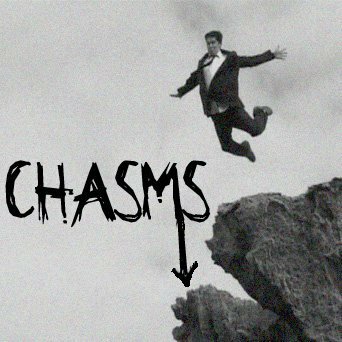 From the basements of New Brunswick, NJ, Chasms play a brand of melodic punk that has me thinking of Planes Mistaken for Stars with a twist of more modern vocal work on this 3 song demo. "C.H.I." starts off the demo with some catchy guitar hooks and over the top vocals. I enjoy the mid tempo melodic work here, but at 1:56 I couldn't really catch the transition to the faster beat and guitar solo. Something about it doesn't quite translate and I found myself wishing they would have maintained the mid tempo feel throughout. "The Antisocial Network" begins with a dual scream before launching into some more mid tempo melodic goodness. The guitar work here is really the standout, and makes these songs come to life. The higher register playing is worked into the main riff flawlessly and does quite well. The band almost recalls a "Wig Out at Denkos"-era Dag Nasty with it's guitar work. "Snooze Button" begins with a barrage of drum rolls and drawn out notes before taking us back to the band's familiar sound. 2 minutes in the band draws the pace down with some slower drums underlying the melodic guitar work. Lyrically the band takes some time to address loneliness, anxiety and the growing concern of deteriorating human relationships in the face of technology. The production quality could be a bit better and I feel that the bass tone could be emphasized more to fill out the single guitar line up better. All in all, not a bad start for these guys, but I would be interested to hear it as the song writing matures and focuses.